Multilingual Translation LTD offers 5 years of experience in providing top-quality service, professional and effective translation, transcription, editing, proofreading and VOICE...Read moreMultilingual Translation LTD offers 5 years of experience in providing top-quality service, professional and effective translation, transcription, editing, proofreading and VOICE OVER campaigns. Our services span over 10 languages, offering no compromise in quality; with a network of over 10 native translators, transcribers, editors, proofreaders and voice-over artists and a continuously growing portfolio. 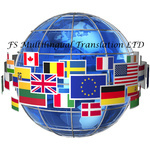 WHY WOULD YOU CHOOSE Multilingual Translation LTD? * We offer more reasonable prices compared to those of our competitors This is a decision that you will not regret. Multilingual Translation LTD provide high-quality translations, transcriptions, editing, proofreading and voice over Every Single Time!